March 13, 2015 – Two Fort Valley State University students earned top awards at one of the largest conferences for student researchers in the country. Frank Ivey, a senior biology student, and Brandon Beaty, a senior plant science biotechnology major, earned two first place wins at the Emerging Researcher National Conference recently in Washington D.C. on Feb. 19-21. The ERN Conference in Science, Technology, Engineering and Mathematics (STEM) is sponsored by several agencies that include the American Association for the Advancement in Science (AAA), Education and Human Resources Programs (EHR) and the National Science Foundation Division of Human Resource Development (HRD) within the Directorate for Education and Human Resources (EHR). 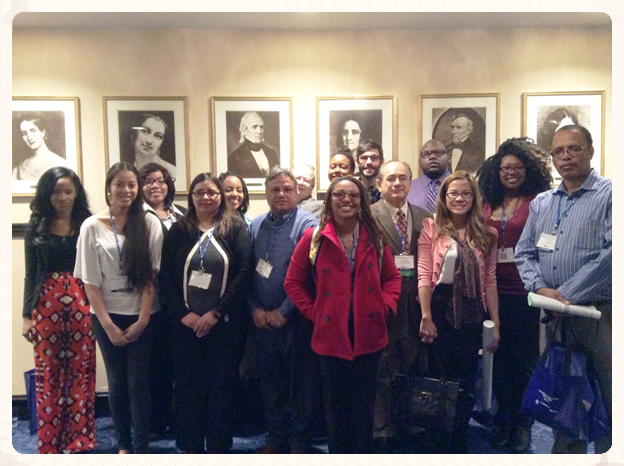 The conference was created for higher education undergraduate and graduate students who participate in NSF-HRD Unit programs, including underrepresented minorities and persons with disabilities. The conference activities involve strategies for applying and succeeding in graduate programs and finding funding for graduate program. This past summer, the Ivey and Beaty conducted research at the University of Florida under the supervision of Dr. Harry J. Klee, a professor and researcher in the Plant Molecular and Cellular Biology program at the University of Florida. Klee is one of the nation’s top researchers in the area of tomato volatiles which are chemicals and genetic compounds that make up the flavor of fruits and vegetables. The FVSU pair identified distinct volatiles and how they interact with biochemical compounds in the fruit, and affected its taste, texture and juiciness. Ivey, a Warrenton, Ga. native, earned a first-place prize in the area of Ecology and Earth Sciences for his poster presentation. Besides earning a first-place prize, he also made personal and professional connections. “It was exciting to meet new people from different schools all over the nation, and talk about horticulture,” he said. “There was a diverse amount of research, and I learned form a lot of students.” Ivey also managed to make a personal and professional contact with a researcher at the University of Washington. Beaty, a Corpus Christi, Tex. native, earned a first-place prize for his oral presentation in the area of plant science, environmental science. “I was nervous, and up the few nights before giving my speech,” he said. Beaty delivered a PowerPoint presentation on tomato volatiles before a group that included more than 600 schools. “I won first place in my category, plant science, environmental and biological sciences, and it was a power point presentation. The very last night was the awards ceremony and I was told that I did good and everything, when I speak and do a presentation I think do horrible every time, but this time, I felt good about it. I was perfectly in my time, I didn’t ramble or anything. The two students received certificates for their win and a monetary prize. Dr. Klee, the research professor who worked with the two FVSU students this summer, said that he and his team are proud of their wins. Ivey had this advice for students that attend huge conferences like the ERN. Beaty had this advice for aspiring scientists. Dr. Sarwan Dhir, professor of biotechnology and director of FVSU’s Center for Biotechnology said seeing our students present their research is always a rewarding experience. “Conducting and presenting research at the undergraduate level is vital to the success of students in graduate or professional school. I am very proud of each of our students and will continue to encourage them in their academic careers,” Dhir said.